If your PS3 won't read discs or games, displays frequent disc read errors or skips frequently, this is the solution you need. 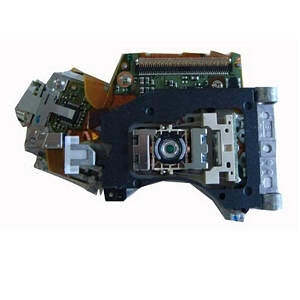 Issues of this type are in most cases caused by a worn out PS3 Blu-Ray Laser, but in rare cases, can also be caused by a defective Blu-Ray Controller Board. Having your PS3's Blu-Ray Laser Assembly replaced is your best bet to have this issue fixed. If your PS3 reads DVD's but will not read Blu-Ray movies or games, your laser is definitely worn out and this service will fix your problem GUARANTEED. QuickTip: There is a risk of the PS3's Blu-Ray laser completely burning out if you turn off the system with the switch at the back (only with older models), while there is a game or movie in the Blu-Ray drive. Always turn off your PS3 with the PS button on the controller or by holding down the power button on the front of the system until it powers off. If the console will not shut down either of these ways, be sure to eject any discs before shutting it down with the back power switch or pulling the cord from the wall or back of the console. Just click the 'Add to cart' button below to have your PS3 Blu-Ray Laser replaced by an Experienced Gaming Console Repair Tech. Includes a Hassle Free 60 Day Repair Warranty! The Model number can be found on the back of your PS3 console printed after the serial number. Click here for details on how this service works. Please provide any relevant details or info in the box above. Items with a * next to them must be selected to continue. If you just need a quote for now you can select any model. The 360 is working great and seems to be running much cooler after having the GPU reballed. I will be forwarding you a ton of business. Thanks again! You replaced the laser in our Wii a few months back and our Xbox 360 just recently. I must say, I am very impressed with the quality of service you provide and the fast turnaround. Thanks again, I will always bring my gaming consoles to you for repairs! Well it took a bit longer than expected because you had to order in a new graphics chip but my Xbox 360 is still going strong over 9 months now! I think the fan mod really made a big difference too. Keep up the good work! My PS3 now reads ALL of my games and bluray movies! We will be back in touch next time one of our systems breaks. Thanks again! It's been a couple years now but I just wanted to let you know our Xbox 360 is still working great. Thanks again for your excellent repair service! Wow, that was fast! No more red lights and it seems to be running cooler now. Good job! I have done Xbox 360 repair myself but I couldn't reball them. This was just the service I needed. Thanks again! Copyright © 2015 ConsoleRepairGuy.com All Rights Reserved. ConsoleRepairGuy.com is not associated or affiliated with Microsoft®, Sony®, Nintendo® or any other brand mentioned on this site.All trademarks and brands mentioned are property of their respective owners.